Air craft: Lockheed Electra. The Electra in this painting was inspired by two different aircrafts: ZK-AFD Kuaka and ZK-AFC Kotare which were the first two Electra’s to arrive in New Zealand. 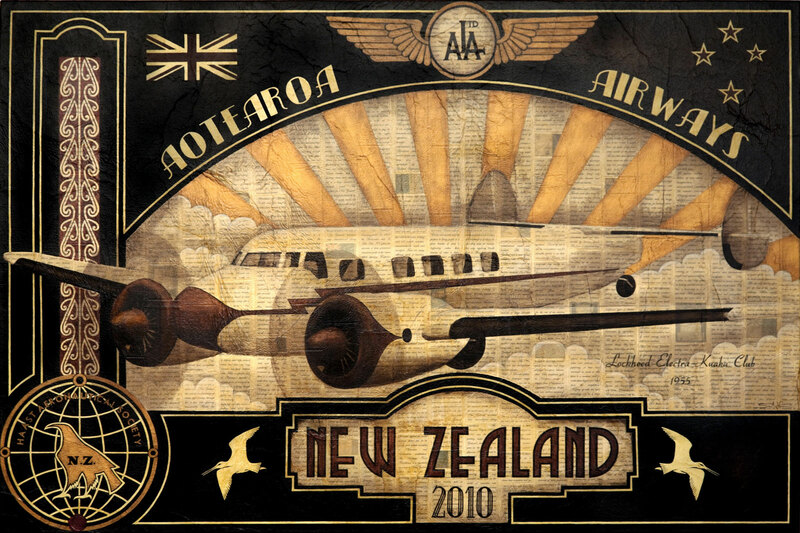 Aotearoa Airlines logo/wings: This was inspired by the five ‘wings’ insignia of the provincial airline main trunk operators between 1934 and 1947. Kowhaiwhai (scroll design): Inspired by Ngaru, a traditional Maori design representing the cutting of the waves as the ‘waka’ moves through them and by the famous koru (fern frond) motif which Air New Zealand first applied to the tail of their aircraft with the arrival of the DC-10 in 1973. Haast Aeronautical Society: A logo I created introducing the Haast eagle to refer to the first largest flying ‘thing’ in the skies over New Zealand. Note: The N, A, C which is highlighted in red is to represent NAC-NZ National Airways Corporation.